Most of us think that this only happen in a movie but this is a true life story of a baby born with one eye in the middle of his forehead. 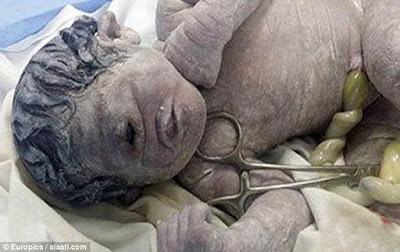 Doctors believe the newborn boy is suffering from cyclopia - an unusual medical condition named after the one-eyed giants of Greek mythology - caused by radiation exposure in the womb. Cyclopia is one of the rarest forms of birth defects and children born with this condition often die shortly after birth.The single eye, and missing nose, is a result of the boy's eye sockets not forming correctly in the womb. According to reports from the Saudi Arabian news website slaati.com, doctors think the deformity could be the result of a combination of medicines taken by the mother or from exposure to radiation. He was born at a private hospital in the north-eastern town of El Senbellawein, in Egypt. Dr Ahmed Badruddin, who is supervising the baby’s condition at the hospital, said the infant was born with other deformities on his body and is only expected to survive a few days. A heartbreaking picture of the child has been released by the family, who are receiving counselling. The disorder may occur as often as four times in 1,000 births but most in most cases, the pregnancy does not go full term. It is more commonly seen in animals.